This is the first complete draft. It includes actions, strategies, and recommendations in the final chapter which is posted on the DPC website. All the chapters can be downloaded individually. The recommendations are only a few pages, but too long to repost here. At this point, it is important to remember that the conclusions and recommendations have not been approved by the DPC. They are consultant recommendations based on our research, interpretation of the evidence, and mandate to develop a plan that enhances and ensures economic sustainability for the Delta while also being consistent with the co-equal goals of the Stewardship Council's Delta Plan. Since the document currently stands at 244 pages (despite moving a lot of material to appendices that will be posted soon), the last two chapters will ultimately be revised into a summary version of the Economic Sustainability Plan. Delete the "de" from modest and the result is most. A recent ACWA report about the draft Economic Sustainability Plan from the Delta Protection Commission had the following incorrect quote. "Most agricultural impacts could be offset by recreation economy gains." The concluding chapter of the draft plan actually states, "Modest agricultural impacts could be offset by recreation economy gains." Those two letters changes the meaning of the sentence quite a bit. Maybe it is my turn to write a scathing letter to John Laird. From the inbox. It is rare that an obscure article in the Milwaukee Business Journal touches so many different issues important to my job and this blog. Check it out while I scream in frustration. A California water-technology company is planning to establish a manufacturing facility and offices in Milwaukee that could create up to 300 jobs. Keville said Milwaukee is attractive because its local companies can supply the services AMDS needs and because of the efforts to brand that area as a worldwide hub of companies whose products involve water. Meeusen said AMDS’s planned move to Milwaukee is further proof for skeptics that Milwaukee can become a international seat of water technology companies. The Business Forecasting Center recently published a brief report on the rental housing market in San Joaquin County. Despite the collapse in home prices that has made purchasing homes very affordable, we found rental housing in the area is still quite expensive and hard to find. I am pleased that the report has sparked a local discussion of an important issue that isn't getting enough attention in this crazy housing market. See these articles from the Stockton Record Sunday and today. Michael Fitzgerald: More Could, Should be Done to Revive S.J. Rental Sector. Should Delta levees be upgraded and then repaired if they fail? Should significant areas of open-water caused by permanently flooded islands be part of the Delta’s future? 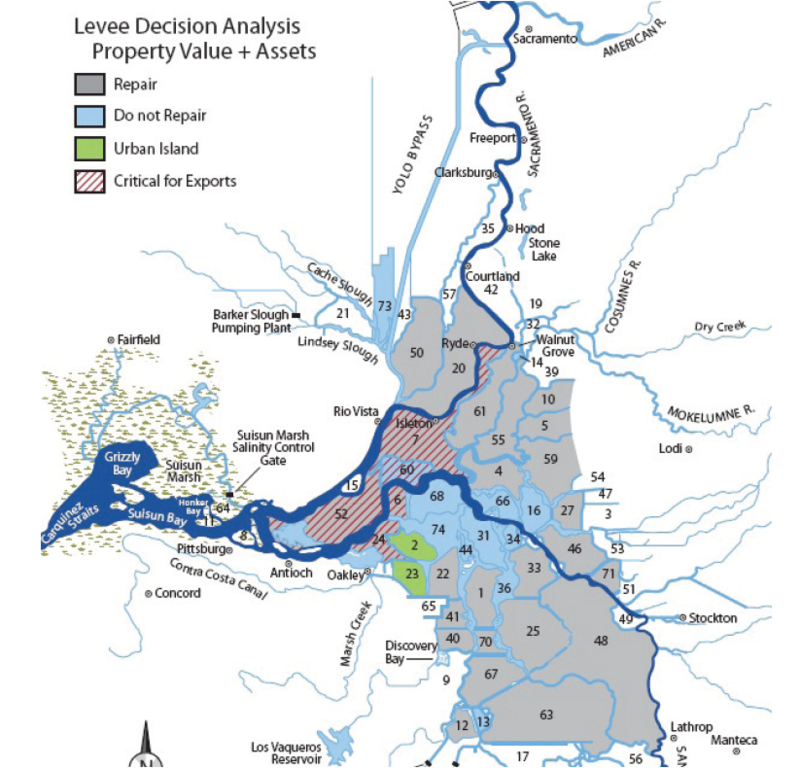 It is a reasonable question and as one who believes in the value of cost/benefit analysis, I like the set-up of the levee decision analysis paper from Suddeth, Mount and Lund of UC-Davis. Unfortunately, their conclusion that the majority of Delta levees aren’t worth the investment or recovery is way too strong given the relatively low assumed values of land, infrastructure and the variety of things that they have not measured, including recreation impacts. Luckily, the editor of the SF Estuary journal appears to have forced them to include more sensitivity analysis results before publishing their paper, a result I consider better than outright rejection in this case since we can see more scenario results from a paper that was already influential. This picture from their paper emerged from a scenario with better land and infrastructure values, and is enough to move the conversation forward. The key result is the 6 central Delta islands that would be converted to open water over time. In the Economic Sustainability Plan, I directed our team to take a serious look at this future open water configuration. Given the absence of key infrastructure in this area, few residents, and low-value agriculture, these islands certainly rank the highest on the candidate list of places we might allow to be converted to open water. On the downside, there are concerns about the impacts on levees on surrounding islands, water quality concerns related to increasing organic material for municipal and industrial water intakes. I thought recreation would be the wild card, and have been a little surprised at the almost universally negative response from recreationists, owners of recreation related businesses in the Delta, and recreation experts who have been studying the area for years. One of the first things I heard was, “It will ruin the 4th of July.” I am usually out of town on the 4th, and didn't know Barron Hilton has been hosting a large fireworks show off Mandeville Tip since 1958 near his duck club on Venice Island. This location is directly in the middle of this open water scenario. It is the biggest weekend of the year for Delta recreation. The next thing I learned is that this area is the most popular area for boating, and that about half of Delta marinas surround the immediate area and in most cases would be potentially negatively impacted by the loss of wind/wave protection and the necessary levee improvements on adjacent islands. I didn’t go to all the recreation focus groups, but my understanding is that it got a very negative reaction from boaters and marina owners who anticipated high waves and winds would drive them elsewhere, possibly out of the Delta all together. Since this is the most popular area for boating and boating is by far the most important recreational activity to the Delta economy, it seems this plan could have harmful negative economic effects that aren’t considered in the Suddeth et. al. models. Few people seemed to think that sailing or other recreational opportunities would fill the void. The last thing I learned is that it could be bad for hunting. I spoke with one farmer who grew low-value crops in this area, and I asked why he didn’t grow different crops. He explained that corn prices have in fact made growing corn high value, but the real answer was that in the Delta there are farmers, farmers who also hunt, and avid hunters who do some farming when it isn’t duck season. He considered himself in the latter category, and insisted he would grow corn if it were 10 cents a bushel, always has, because it leads to good duck hunting and that is the top priority. It seems there is more underlying the value of land than just the value of crops. So, how much is all that worth? I don’t know for sure, but it is a potentially big deal, especially if it really is as negative for boating as our initial feedback suggests. We have learned that levees that protect low value agriculture may be supporting high-value recreation. Personally, I would like there to be less talk about Delta recreation/tourism as a driver of income and jobs, and more talk about it just being unique and fun. That’s worth something, but it isn’t anywhere in the computer models about Delta levee decisions. Perhaps it should be.